SALT LAKE CITY, Utah – HARMAN’s DigiTech continues to expand its rave-reviewed iStomp e-pedal lineup with the introduction of its 3Q three-band EQ e-pedal. 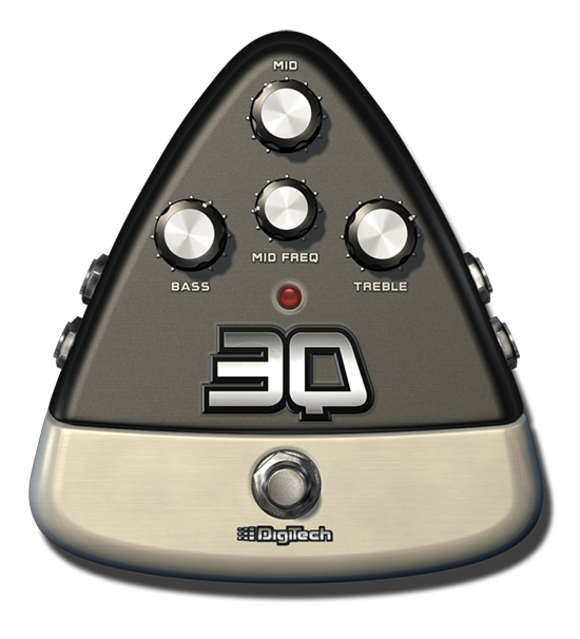 The 3Q gives guitarists and musicians three frequency bands of adjustable passive and active equalization for wide-ranging tone shaping. The 3Q features only 4 controls making it extremely easy to use. The Bass and Treble knobs are fixed-frequency boost/cut controls that are used to increase or decrease the low and high frequencies by +/- 12dB. The Mid Freq knob employs semi-parametric EQ with a sweepable frequency range of 500Hz – 3kHz while the Mid knob provides +/- 12dB of boost or cut for precise midrange tailoring. The DigiTech iStomp is a new concept in guitar stompboxes that allows musicians to turn the iStomp into any pedal in the Stomp Shop online pedal store. Offering almost limitless sonic possibilities, the iStomp connects to an Apple iOS device where musicians can use the Stomp Shop app to load it with the e-pedal of their choice. The Stomp Shop is a free app and comes with two of the most popular requested pedals, the DigiTech Total Recall Delay™ and the DigiTech Redline Overdrive™. It gives access to more than 40 additional pedals that musicians can browse, try out and purchase, with more pedals added every month.